Explore the cultural heart of vibrant northern India on this cycling holiday. Discover Rajasthan's impressive Moghul architecture, visit the incredible Taj Mahal and look out for tigers in Ranthambore National Park. Taj Mahal, Agra Fort and Jaipur - Explore the majesty of the Moghuls and the Rajput princes. Arrive Delhi and check-in at the hotel. If your flight time allows you may choose to take an optional sightseeing tour of Old Delhi, visiting Jama Masjid mosque which is one of the largest and most well known in India and Chandni Chowk market place, built by Shah Jahan who also created the Taj Mahal. Drive through India Gate and see the government buildings, before returning to the hotel. 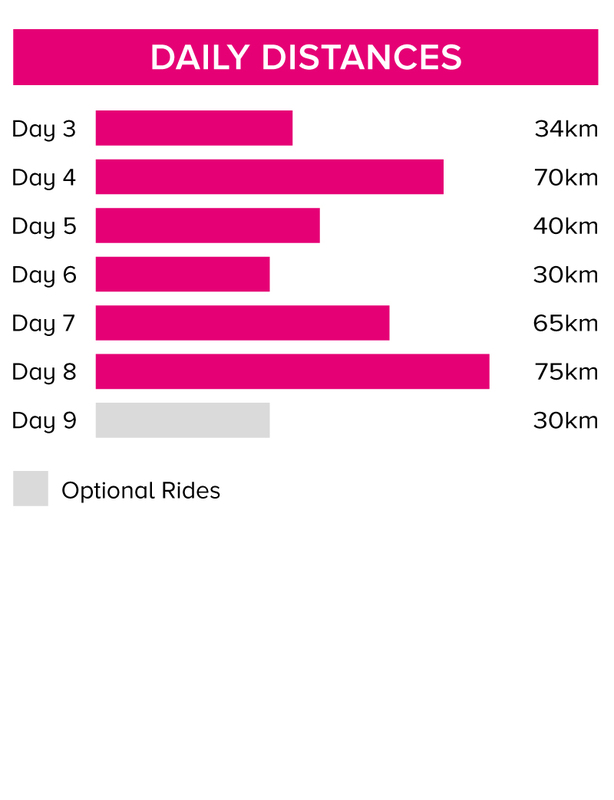 We will begin our cycle journey tomorrow and over the coming days we will be covering on average some 56 kilometres a day, spending up to six hours in the saddle. This morning we leave Delhi behind and drive for about four hours heading south to Agra. Once the capital of the mighty Moghul Empire, the city is littered with some of the country's most opulent and spectacular buildings and one particularly fine example is its imposing fort, whose grandeur and importance has seen it inscribed on the UNESCO World Heritage List. Built by Emperor Akbar and then embellished by his grandson, Shah Jahan, this was once a great city, with palaces, mosques and halls all lying behind the protective embrace of 20m high walls. After visiting Agra Fort we will watch the sunset over the Taj Mahal, surely one of India's most beautiful and most revered monuments. Certainly one of the most universally recognised buildings on earth, the Taj Mahal was built by the emperor Shah Jahan to honour the memory of his beloved wife Mumtaz. Today starts with a drive of about two hours to the abandoned city of Fatehpur Sikri, lying close to the western boundaries of Agra. Today it remains a ghostly testament to the power of 16th century Moghul India and is a perfectly preserved example of an imperial court. After our visit we jump on our bikes for the first time and begin our cycling adventure. Today's almost flat ride will be on back roads passing through picturesque rural India, with its fascinating villages, waving children, and colourful traffic. On reaching Bharatpur we will check in at the hotel depending on your energy levels you may wish to take a walk round the city centre and refuel on a Rajasthani Thali filled with tasty and colorful dishes like Chicken Tikka and Paneer Tikka. Bharatpur is also famous for a few sweet dishes including mango soufflé. Our total cycling distance today is approximately 34 kilometres. 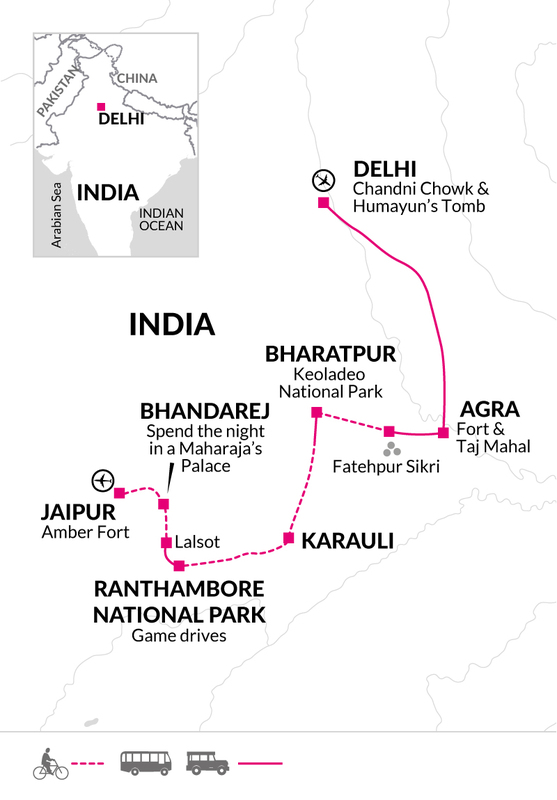 Day 4 - Pedal through scenic villages, agricultural land and past red-sandstone quarries to Karauli. Today starts with a short drive of 30 minutes then get on our bikes and ride along small tarmac roads through scenic villages and though agricultural land. The landscape we ride through becomes more agriculture, and we pass more small villages and people tending crops including mangos, fennel, onion and sweet potato on the cultivated land. This area is also known for its red sandstone used for the construction of the magnificent Red Fort and the majestic Rashtrapati Bhavan. We will cycle past some of these red quarries on our way to Karauli. Ranthambore National Park on the eastern borders of Rajasthan, is one of India's best 'Project Tiger' conservation projects. Cycling there today we follow a series of good roads and quiet cross-country tracks, with quite a few ascents and descents, as we make our way towards what was once the private preserve of the Maharajahs of Jaipur. The last part of the journey (around 70 kilometres) will again be undertaken by bus. Ranthambore encompasses nearly 400 square kilometres of lush jungle, turquoise lakes and ancient temples, providing a rich haven for crocodiles, leopards and some 300 species of birds. It is also one of the best parks in the country for spotting tigers. Today we enjoy morning and evening game drives in the park, with an option for those that wish to also pay a visit to some of the local villages by bike. Ranthambore is also home to one of the oldest forts in the country, from whose ramparts there are some fabulous views towards the Aravali and Vindhya Hills. We start with a drive of about 50 km to Lalsot. From here we start our ride; we follow small roads and tracks through villages and agriculture land, passing Hindu settlements, temples and shrines. Our accommodation tonight is in a Maharaja's Palace. Built in 1938 it is the family home of Maharaja Krishna Chandra Pal, who is the 181st in an illustrious line tracing itself back to Lord Krishna. The Maharaja and his family still live here, and the palace has been converted into a hotel. The façade stands out against the ancient town of Karauli, which dates from 1348. The interior is decorated with an eclectic melding of Oriental and Art Deco forms and you can walk around the grounds and explore the gardens and orchard. Today we start cycling from our hotel and pass by bike small villages and farm land heading towards Jaipur. We cycle through the country side on a quite road surrounded by beautiful green -brown hills dotted with small trees and scrubs with hill-top forts silhouetted against the sky. We drive the last hour to Jaipur where we spend our final two nights. The evening is free for us to enjoy the city at our own pace and for those interested the leader can organise a cookery demonstration with active participation. Early morning we will leave for a short ride (optional) to enjoy being on our bikes away from the crowds in the villages that skirt Jaipur. Later we return hotel for the breakfast and to freshen up before leaving by bus for a full day exploring Jaipur's magnificent highlights. We begin with a visit to the Amber Palace, a superb marble and sandstone fortress on the outskirts of the city. Back in Jaipur we visit the splended City Palace, a dazzling fusion of Moghul and Rajasthani design, before taking in the unique majesty of the Hawa Mahal which is famous as the ' Palace of the Winds'. Afterwards we visit the remarkable 18th Century observatory of Jantar Mantar. Tonight we enjoy our final night in India and celebrate the trip in a traditional restaurant. Bear in mind that the area is tropical with high humidity. Lightweights are needed all year round with some warmer clothes (ie fleece and long trousers) for the cooler winter evenings (November to March). Bring cycling gear such as gloves and padded shorts. Whilst cycling in shorts is acceptable and expected, please note that for visits to temples and city sightseeing, tight fitting sleeveless t-shirts, brief or tight shorts and miniskirts should be avoided, since they attract unwelcome attention. Although entirely voluntary, tipping is a recognized part of life in this region of the world. Some local staff will look to members of the group for personal recognition of particular services provided. In order to make things easier for you, the Tour Leaders may organise a group's tips kitty and if this is the case, they will account for it throughout the tour. Accordingly, you should allow for £45. Accommodation in India is as varied as the country itself. On our tours we stay in a mix of hotels, heritage properties and homestays. Standards do not equate to standards in the UK and it's best to approach each type of accommodation with an open mind. Service can be slow in places especially when travelling with a group. For the most part hotels do not have heating so in the winter months it can be chilly and if you feel the cold you may wish to ask for extra blankets. Hot water is not always available 24 hours a day in some of the smaller properties, and with a group staying you might find if you are showering last you may miss out on the hottest water. Ranthambore National Park is closely managed by the Indian Authorities. The number of vehicles permitted to enter the park at any one time is restricted and all game drives must now be booked and paid for well in advance. We recommend you book as early as possible in order to have the best chance of securing a space on a game drive. In order to secure a booking we must provide your passport copy and full payment for the safari at the time of booking. Once a game drive has been booked no changes are permitted and the payment is non-refundable. In order to proceed with bookings we require the following: A scanned copy of your passport - you must carry your passport during the game drive and if you renew your passport before travelling then you will need to take both passports with you. We book all of our game drives in shared jeeps, with a maximum of 6 passengers per jeep with a driver and naturalist guide. On occasion we will be sharing jeeps with non-Explore passengers. We will purchase seats for all passengers as soon as permits become available, usually 4 months prior, after this point it is not always possible to secure additional spaces. We cannot guarantee the operation of any game drives until the necessary permits have been purchased. We aim to purchase the permits as soon as they are put on sale, whilst this is usually at 120 days before the date of the game drive on going changes to the booking system means that we cannot guarantee this. On this trip we cycle 339 km over six days (an average of 56 km per day) following backroads and some larger main roads. The terrain is mostly flat however the heat of the day can make the days a little more tiring. A support vehicle is available throughout the tour. We have graded the route as moderate. Your included bike is either a 21 or 24 gear Trek 3700 mountain bike with front suspension or 3	Merida matts-20D and 40D and will be the correct frame size for your height. A 2.5 litre handlebar bag and water bottle holder are included as well as the facility to fit your own pedals or saddle if you wish to bring them. A support vehicle accompanies the rides throughout the tour. We provide spare parts and take care of the day to day maintenance. All you need to bring is your own helmet.